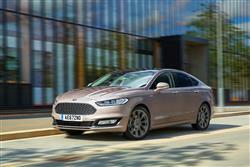 Find out everything you need to know on the new Ford Mondeo Vignale from independent vehicle review website Car And Driving. You can watch the video review to the left to see more of the car or read their written review below to get a true insight from an expert in the automotive industry. Ford's current Mondeo looks to revive the flagging medium-range family hatch sector. Does it have what it takes to break the spell of the premium marques? Jonathan Crouch reports on the improved range. The Ford Mondeo pulls out all the stops in a bid to convince British buyers that the medium-range family hatch isn't a thing of the past. With excellent economy from a range of downsized engines, the sort of cabin tech you thought was the preserve of the premium German marques and a box-fresh chassis with an all-wheel drive option, there looks to be life in the Mondeo yet. A lesser manufacturer than Ford might well have given up. After all, sales of mainstream medium range family saloons and hatches have collapsed in recent years, falling to around a third what they once were as recently as ten years ago. The Mondeo had the unfortunate distinction of being a car that got markedly better with every consecutive generation but which was rewarded with progressively worse sales. Can this latest model turn things around? It has market conditions on its side. The economy has improved and the love affair with premium badges couldn't last forever. As the used market became flooded with BMWs and Audis, resale values crumbled. If Ford could step in with a genuinely convincing reason to buy something bigger and more luxurious, buyers might return to the fold. To that end, the Blue Oval has pulled out all the stops with the fifth generation model. Ford's gone big on engine choices. It had to really or risk falling behind the curve. The headline powerplant is the 210PS twin sequential turbocharged 2.0-litre diesel, but that's backed up by a more affordable revised 2.0-litre TDCi diesel engine with single variable geometry turbocharger technology good for either 150PS or 180PS. All three 2.0-litre TDCi variants feature a revised engine block, cylinder-head and fuel injection designs and Ford's lean NOX trap exhaust after-treatment system for even cleaner emissions. It doesn't stop there. Not even close. There is a 1.0-litre petrol engine. Yes, really. This one develops 125PS and is much the same as that found in the Fiesta, although specialised engine calibration takes into account the greater weight of the Mondeo. There is also a 160PS 1.5-litre EcoBoost unit, while a 2.0-litre EcoBoost powerplant has been developed in 240PS form. Buyers can even opt for a Mondeo Hybrid. It uses a specially-developed 2.0-litre petrol engine combined with two electric motors - one to drive the wheels and another to supply regenerative charging - and 1.4kWh lithium-ion battery. The 150PS and 180PS diesels are available with Ford's Intelligent All-Wheel Drive system, which offers a seamless transition between front-wheel drive and all-wheel-drive performance to automatically enhance traction and road-holding when needed. The Mondeo's also the first model for Europe to be built on Ford's global CD-segment platform, which debuts Ford's integral link rear suspension. The all-new platform and body structure combination delivers 10 per cent more torsional stiffness than the outgoing model and the Mondeo also gets electrically-assisted power steering for the first time with variable weighting. More importantly, road noise reductions of around three decibels in the rear and two decibels in the front have been achieved. If there's one thing that's defined the Mondeo's design, it's that it's become bigger and more expensive-looking with each passing generation. This one doesn't divert from that precedent. The front gets Ford's Aston Martin lookalike grille with laser-cut headlamps and a power dome bonnet, while the fuselage is far more sculptured and sophisticated in its design than its immediate predecessor. Ford calls the roofline 'a sports coupe profile' which might be pushing it a bit, but it's a handsome thing. The estate version incorporates a retractable panoramic glass roof for the wagon bodystyle. Inside, Mondeo drivers are met with a digital analogue instrument cluster, while a wrap-around centre console design delivers a cockpit-like feel. Materials quality has stepped up a notch again, with a soft-touch instrument panel and flock-lined central front storage area and glovebox. Smart-design front seats feature a thinner seat back - enabling rear seat passengers to enjoy additional legroom without sacrificing space for driver and front passenger. Trim levels now start with 'Zetec Edition', then buyers have the choice of something sportier ('ST-Line' or 'ST-Line Edtion') or plusher ('Titanium Edition'). For something truly luxurious, you'll need the flagship 'Vignale' variant. As standard, all models have navigation, a DAB tuner, front and rear parking sensors and cruise control with a speed limiter. 'ST-Line' series variants introduce extras including a body styling kit, lowered sports suspension, a Ford Power start button and a darkened headliner. Privacy glass and 19-inch 'rock metallic' alloy wheels are added on the 'ST-Line Edition' variants. Safety technology is a strongpoint. All derivatves get 'Active City Stop' autonomous braking to mitigate or avoid low-speed collisions at under 31mph. Plus there's Pedestrian Detection, which identifies people and reduces the severity of collisions at speeds of up to 50mph. A radar system also drives the Distance Indication feature and Adaptive Cruise Control technology. Cameras support a Lane Keeping Aid and Traffic Sign Recognition, which provides the driver with the speed limit, cancellation signs and overtaking regulations flashed up on the instrument cluster display. There are also full adaptive LED headlights on offer, as well as Active Park Assist featuring Perpendicular Parking. The Mondeo can't succeed in its particular sector with off-pace economy and emissions. Despite fleet sales falling as a proportion of total Mondeo registrations, Ford cannot afford to overlook this target market segment, especially if it wants to resurrect its company car client base. Fleet managers will like the look of what they're seeing here though. The diesels have followed the downsizing trend of the petrol engines, delivering better fuel efficiency and emissions at the same time as power has increased thanks to advanced technology. The 1.0-litre petrol engine shows how it's done, recording emissions of just 119g/km. The 1.5-litre EcoBoost unit packs 160PS but still emits just 134g/km. Even that's overshadowed by the ECOnetic Technology 1.6-litre diesel engine that looks set to hit its target figure of 94g/km. The hybrid model also dips under the critical 100g/km barrier, registering a saintly 99g/km, which is some going for such a sizeable vehicle. Building one car for a number of markets was the original idea behind the Ford Mondeo and while this has clear cost-saving advantages for its maker, its also tended to mean that the Mondeo lagged behind many of the cars in its class when it came to technology. The development cycles on the car were just too long for it to be cutting edge. That's something that Ford is increasingly aware of and the latest version of this model has been engineered with a certain amount of future-proofing in mind. That said, it's been fully fifteen years since Honda launched the Insight in the UK, and Ford has only just got on board with the hybrid concept. That's some way behind the eight ball and the Blue Oval needs to rely on other clever engine and cabin tech to sell the Mondeo. Perhaps it's time that UK customers rediscovered the charms of this most honest of family vehicles. Ford's betting the house on it.